So how long is a youth soccer game? 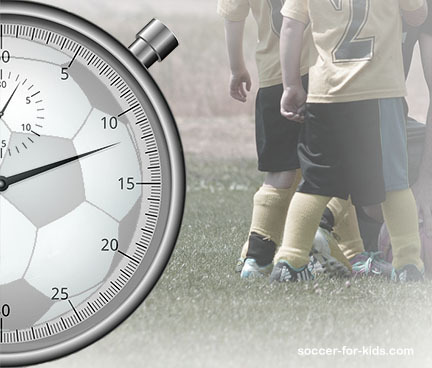 You're a busy parent and you need to know how long your kid's soccer game will last. In this post you'll learn the different times of youth soccer games for your child's age group. Soccer games are always divided into two equally long halves with a short halftime sandwiched between the halves. The exception to that is some leagues prefer 4 equally long quarters for u-8 (under 8 years old) and younger. The exact length of a youth soccer game, particularly the youngest age groups is sometimes determined by the individual town or county league, but here are the recommended lengths of soccer games for kids, shown here in this table, and listed below. U5 and U6 play 20 minute games. U8 play 40 minute games. U10 play 50 minute games. U12 play 60 minute games. U14 play 70 minute games. U16 play 80 minute games. U19 play 90 minute games. The official FIFA rules say halftime should not exceed 15 minutes and that is the standard by which the majority of the world plays for full-sided soccer matches. For youth soccer halftime is usually only 10 minutes for the older kids and only 5 minutes for the youngest aged groups of soccer players. 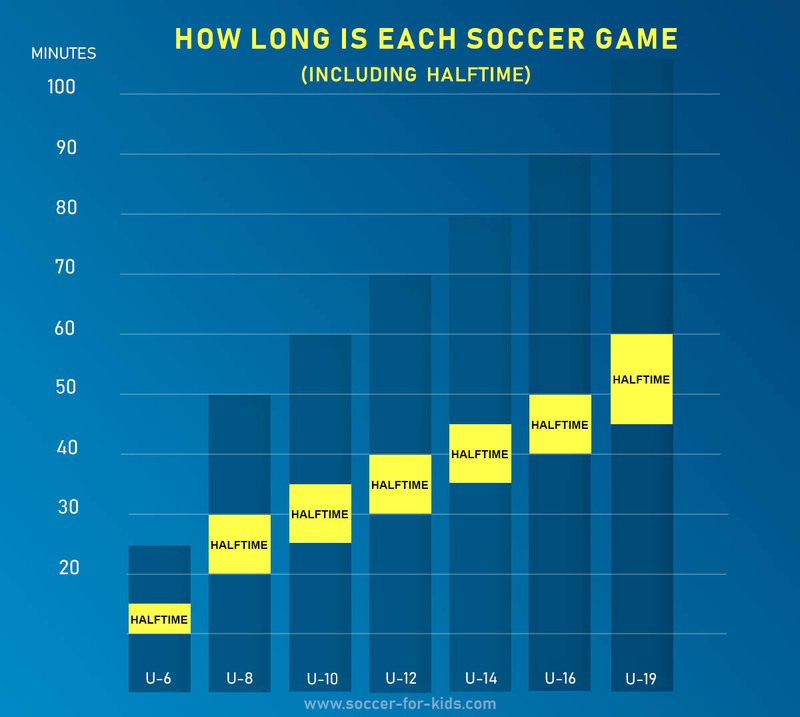 The chart below show you how long a game lasts including the recommended halftime rest periods. I'm not a big fan of playing any overtime in youth soccer for the young kids, but that's a topic for another post. Overtime consists of two 10-minute halves if the score is tied at the end of the regular game. If you break down the playing time for each age group by half, you can see how the games get progressively longer as the kids get older. As the kids get older, with each step upward in an age group, each half of a soccer game only lengthens by 5 minutes. The overall time increases by 10 minutes and this difference means a significant more amount of physical effort is put forth by the player. Should kids younger than 4 even be paying actual soccer games? If so, what's the best length of a soccer game for the youngest group of players? Let's take a look. Playing actual soccer games with 10 minute halves is plenty long enough for 4 and 5 year olds, but what about the 3 year olds? After running a youth soccer coaching business that specialized in mentoring kids ages 2-5 for quite some time, I have a few thoughts on how long the games should be for this tender young preschool aged children. Actual games-when only 1 ball is used-should be kept very short. Anything longer and kids this age lose interest. quickly. They want to be able to kick the ball frequently and even traditional 3v3 or 4v4. The majority of soccer practice should be done where each child has their own ball. Imaginative playful games are very useful in building the two most basic skills of dribbling and shooting. Playing a real soccer game-we called them scrimmages- for a 5 minute period is a good way to introduce them briefly to the concept of competing for "ball time"
It's both more productive for skill development and a whole lot more fun to play soccer games where each child has their own and maximizes the number of "touches" on the ball. I hope you found this post on how long kids soccer games last helpful.